Hello Friends!! Again, I have been neglecting my blog! Life is good though...beautiful sunny days and counting down the last days of the school year. As much as I'm looking forward to summer break, I am kind of dreading saying goodbye to my supersweet thirdies. They are a great bunch I've got this year! Any hoo...I am super excited about a new product I've recently posted. Even though it is already for sale in my TpT store...it is still in the draft phase and I'm still fine-tuning. I thought I would post about it today to see what my blogging buddies think. I would love feedback and suggestions for improvement! Since I left first grade and began teaching third, the importance of increasing the level of reading comprehension has become critical. Most of my students are great "word readers", they are using their accuracy strategies and are able to read with decent fluency. They also are able to retell a story and regurgitate facts from a non-fiction text. However, where they tend to fall apart is when the expectation is "deep" understanding of literature and synthesis of new learning from a non-fiction text. The Common Core expects students to analyze text and apply what they've learned by making new connections. That is really, really hard for my students, and I've struggled to find ways to move them forward in their learning. Further, it has been a challenge to find ways to assess their comprehension effectively and track their progress to help them in setting meaningful goals. For several years, I have used the CAFE Menu by the Two Sisters. It is a great comprehensive way to teach reading strategies including accuracy, fluency and comprehension. However, I have found that we need much more focus on the Comprehension part of the menu than we the other parts. I wanted a different "menu" just for the different levels of reading comprehension. I also wanted a way to get my students thinking about and responding to text in a deeper way while also assessing their progress. 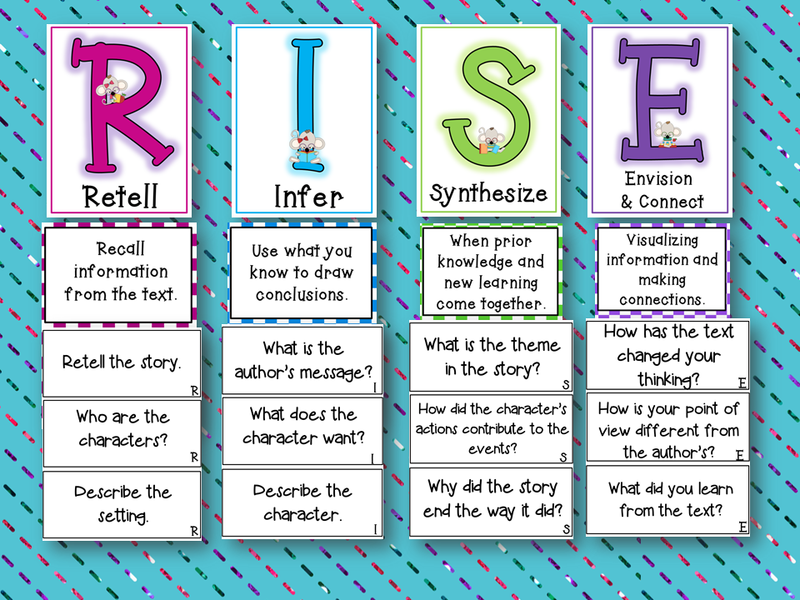 I came up with the RISE Menu, which is an acronym for Retell, Infer, Synthesize, Envision & Connect. It is a continuum of reading comprehension, with each letter of the acronym representing a different level of understanding (Retelling being the lowest level, and Synthesizing , Envisioning & Connecting being the highest level). I thought of different response questions and activities that would go with each category of the menu and created response sheets and a rubric for those responses. These response sheets, I am hoping, will give students plenty of practice with responding to text on a variety of levels and also give me a way to assess their progress (a rubric for their responses is included, as well as student progress score sheets for record keeping). The menu will help my students and I to choose questions and activities that represent the different levels of comprehension, rather than always falling back on the lower level stuff. It could also be used as a springboard for book discussions. 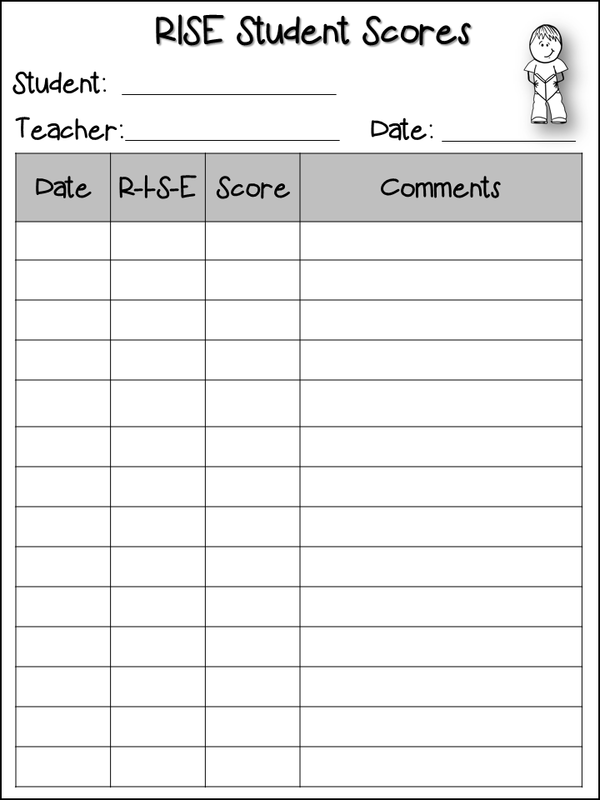 This resource pack contains the materials needed to create a classroom display (multiple designs and sizes are available), an 8 1/2 x 11 version of the complete menu (with room to add more activities), response sheets for fiction and non-fiction, a rubric for these responses, and a few different record keeping sheets. I am working on a document that will give more specific direction and ideas for implementing the menu, but I haven't completed it yet. I would love your ideas to help me to finish this part of it!! Here are some snapshots of the product....let me know what you think! 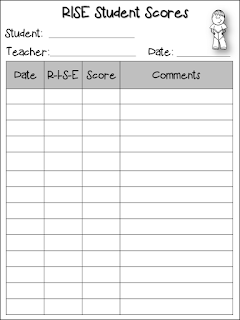 After you check that out....have a gander at this very useful Teacher Data Binder....chuck full of record keep sheets to keep you organized and prepared for progress reports and teacher evaluation!! I am so frustrated with it...grr! I really like the organization of your menu and the fact that there are a range of strategies from which to choose. Will check it out! This is so awesome. As a fellow third grade teacher, I still have many students who are in the literal stage of reading and we are still working on the 'right there' stuff, but for my higher readers, I have the same struggles to get them to dig deeper. 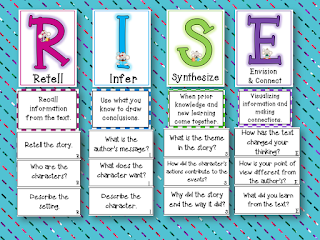 I am looking forward to exploring your RISE menu- what an awesome idea!! This looks great. I am looping to third next year with my second graders. The majority of my class is reading 100 words per minute accurately. I will really be focusing on comprehension next year. This is just what I need. I just found out that I am going to third grade next year. Got any advice or must have products or anything? I am gonna have to start stalking you more! A few people travel to remote nations with the end goal to procure quality educational preparing. HOSPITALITY MUT Securing formal education has turned out to be one of the best needs in life today.